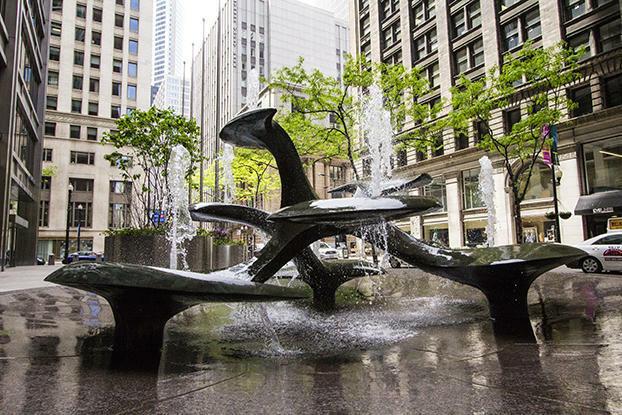 As we continue to support Chicago&apos;s Year of Public Art, I thought of Chicago&apos;s Fabulous Fountains, which happens to be a new book by local author Greg Borzo. Greg has written about a vast range of Windy City topics over the years, and he&apos;s one of the go-to experts when people want thoughtful commentary on such matters. I reached out to Greg to ask him a few questions about his favorite fountains and how these unique objects contribute to Chicago&apos;s public art landscape. You&apos;ve written a number of books on Chicago history and culture, so why this book and why now? While giving tours of Chicago for the Chicago History Museum over the past several years, we would occasionally pass a fountain. Tour guests would often ask me about it, often saying that they never noticed the fountain before, even though it was in plain site. I was embarrassed to know nothing about it. Like everyone else, I did not notice or appreciate fountains. Realizing this made me research a couple of them and sparked my curiosity. Discovering interesting stories about a handful of fountains convinced me that other fountains would be similarly interesting. The stories behind many of the fountains are fascinating in terms of debates over their placement, artistic merits, cultural meaning. Do you have a favorite story that perhaps didn&apos;t make it into the book? Or a detail or two worth sharing from an existing story? Some fountains are clear in their design. 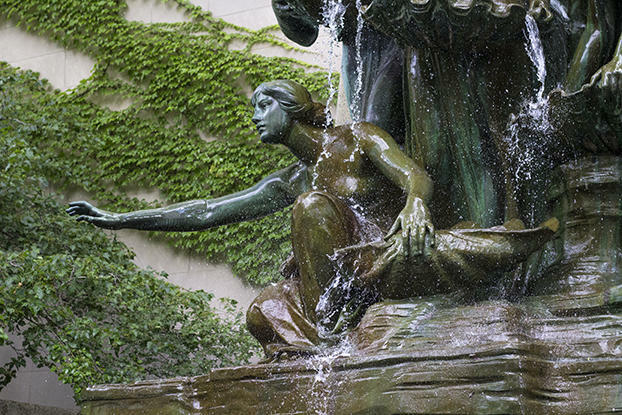 Others, such as the Harris Bank Fountain, are abstract and open to interpretation. This curvaceous fountain features seven protrusions over which water flows smoothly but spiritedly. Its a favorite spot on my fountain tours because so many people see so many different things in it, including petals, pedestals, lily pods, fins, anchors and toadstools. My interpretation that the fountain represents the Earth, with its seven continents, awash in and arising above the waters. No one knows what the designer, Russell Secrest, intended to depict. Perhaps all of the above—and more. I lived in Hyde Park for years and I remember when I moved there, the Drexel Fountain was most definitely not working. Are there other recent revitalization fountain stories that you&apos;re particularly impressed with in the past few years? Yes, another great fountain renovation was done in Washington Square Park. In 1906, Alderman Colonel Robert McCormick (future publisher of the Chicago Tribune) donated money for a fountain in the center of this elegant park. It featured a wide concrete bowl atop eight-foot-tall columns. It was a simple but handsome design, somewhat unusual in its height. Over the years the area deteriorated, and the fountain was removed in 1975. In the late 1990s, Mayor Richard M. Daley launched a fountain program, and this site was chosen for a fountain. Rather than creating a new fountain, the city decided to reinstall McCormick&apos;s Fountain. Ed Windhorst, then with De Stefano and Partners, faithfully recreated the fountain from a few old photographs. Installed in 1999, his work won a Chicago Landmark Award for Preservation Excellence from the Chicago Dept. of Planning and Development. Chicago is so fortunate to have a vast array of different fountain types scattered throughout the city. If you create a new fountain or two, what would you put in the mix? I would like to see the city add dynamic, interactive fountains. Modern, innovative fountains allow visitors to interact with the water. Some attract attention by integrating flames, video projections and moving parts. Also, the City of Big Shoulders needs more big fountains. Navy Pier, the lakefront and bridges over the Chicago River would be great places for big fountains to splash illuminated, colorful water. Most of all, I&apos;d like to see Chicago build and continue to operate fountains throughout the winter. The heated water would flow from the fountain and freeze as it lands, creating beautiful, ever-changing ice sculptures. Any truly "lost" fountains that you were unable to locate during your research and such? No, I was able to at least find the location of the ones I heard about. I hate to ask such an obvious question, but do you have a favorite fountain or two? And might you tell us why? The one I&apos;m sitting next to, looking at and listening to. But I am partial to Crown Fountain because it is so successful in bringing people together. Also, I love the Fountain of the Great Lakes because it&apos;s in such a beautiful setting and expresses the need to be good stewards of the Great Lakes. From the newly-restored Crown Fountain in Millennium Park to other great must-see Chicago fountains, read more on the blog and in the City of Chicago Public Art Guide.